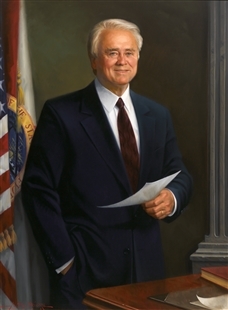 The seal of the state of Florida, emblazoned on the state flags is just visible in this portrait of Bill Young. 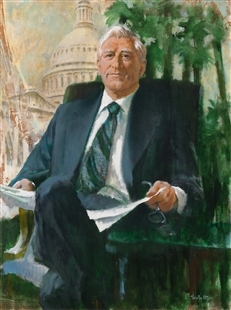 Young was the first Floridian to chair the Appropriations Committee, and the artist has depicted him with a symbol of his state and with the time-honored indications of an official state portrait: papers, a highly polished desk, and a hint of classical architecture in the background. This is one of many portraits in the House Collection that attempt to illustrate both allegiance to the Member’s home district and also leadership of a House Committee.